Believers like Jeyarani leave home in desperation to find work, and her story typifies the trauma many families are now facing. We look at the current situation and how LEFC (Lanka Evangelical Fellowship of Churches) are helping in these difficult times. So what are the causes? And how are our churches affected? A legacy of a 25 year civil war and in recent years a series of poor or failed harvests has left rural families in increasing debt. With many farmers giving up (and consequently fewer jobs for day labourers), it means that men leave our churches in desperation to find work in cities and abroad. Also, some women go to the Middle East. As a result attendance at most of our churches has fallen. The impact on families and churches is very damaging. With long periods apart, men and women often fall into sexual sin and marriages break up. When the women either work abroad or are just not coping as they have been deserted and are the only bread-winners, children are often passed on to relatives or friends to look after and are neglected. The long term impact of family breakdowns on both the families and the churches is a great cause for concern. Has the drought situation improved? Sadly although in some ways the situation is marginally better than last year, in other ways it’s worse. Initially encouraging rains stopped during the final six weeks before this year’s main rice harvest. Consequently, of a total of 358 acres of rice planted by LEFC churches, 263 acres (74%) were lost. 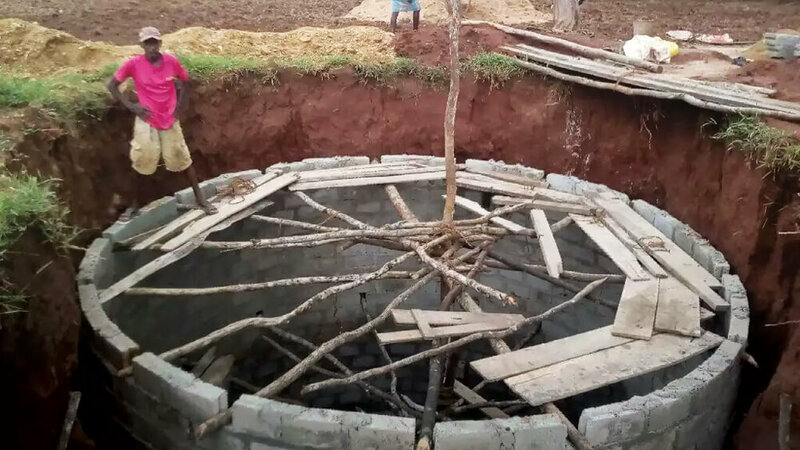 Realising food would be very scarce later this year, LEFC tried to maximise food production while the well water lasted. All available LEFC land was cleared and planted and advice sought from the Ministry of Agriculture to obtain best quality drought resistant seed. 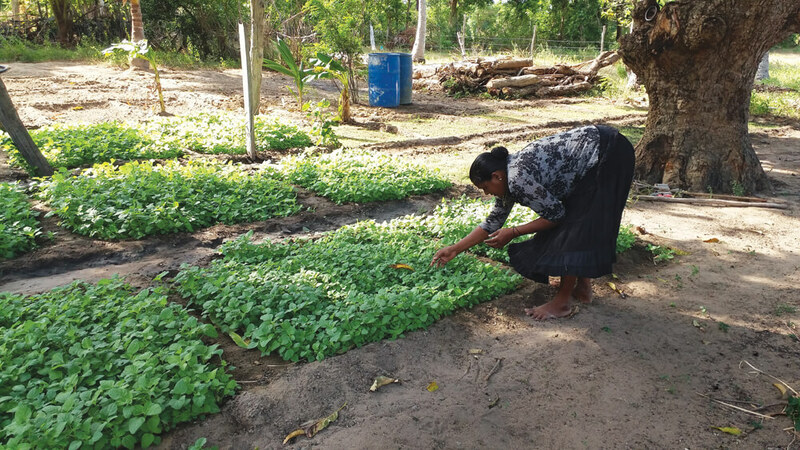 With more out-of-season rain this spring than expected, vegetables and peanuts were grown successfully. Although a great help in the short term, these do not replace the staple diet of rice. The summer has been very hot and dry. Many food prices have doubled, particularly vegetables. Animals are dying and any remaining water in most wells is undrinkable. The social impact of another year’s suffering, on top of last year, is disastrous. How can LEFC help keep families and churches together? As Christians, we need God’s guidance and support as we provide practical answers to our brothers and sisters in Sri Lanka. LEFC is doing all it can to keep families and churches together by helping to provide a sustainable life in the villages. Culturally and practically, people find it very difficult to move away. Help involves ensuring basic ongoing needs are being met, such as water, food, housing, medicines and clothes. But we’re also putting in steps to support existing employment or provide new work. How can we further support LEFC churches? Any help is greatly appreciated. This could be to meet ongoing basic needs or to help with funding self-employment requests. Churches could consider linking up with a sister LEFC church to support them. LEFC church workers visit all the families to pray with them and assess their needs. They send requests to the office at 6 Mile Post, detailing the history of the family and the needs. These are prioritised and as funds are available requests are approved and funds released. Jeyarani’s family fell into debt and they felt the only solution was for her to work as a house maid in the Middle East. It had a devastating impact on the family. Jeyarani is married to Jothirajah and they have four children. She was brought up as a devoted Hindu and was involved in all the rituals, witchcraft, devil dancing, horoscopes and more. After much suffering during the civil war, they settled in Vishvamadu and started attending the LEFC church. She was baptised in 2012 and they both became zealously committed to the work. 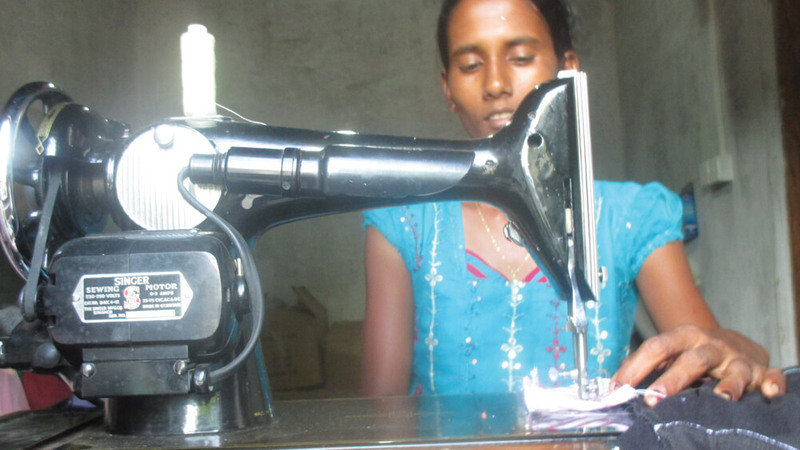 Since her husband is partially blind so cannot work, she had to take on labouring work to provide for the family. However, the labouring work was irregular and she was not earning enough to feed and educate her family. They sank into debt and extreme poverty and she went through a period of depression. In desperation, she eventually decided to go to Saudi Arabia to work in a Muslim house, which an agent arranged for her. Jeryarani received an advance payment that she gave to her husband and children before leaving home in tears. The whole family accompanied her to the airport in deep distress. Slowly her family fell apart. Her daughter Thivya was taken to her cousin’s house, 50km away. She became sick and, because there was little medical care, got worse, which was a great worry for her mother. The eldest son went astray, married a nonbeliever at the age of 19 and gradually stopped attending church services. Eventually, only Jothirajah the father and the younger son were living in the house while the others had scattered and were doing their own thing. The younger son’s education was affected by his parents’ inability to take an interest in his progress. At first Jeyarani was sending money each month, but as time went by her master in the house delayed paying her. With no money reaching her family, shop owners eventually refused to give them any more food. Meanwhile the master of the house mistreated Jeyarani and abused her when his wife was away. She was very depressed and was all alone thinking and crying to the Lord about her desperate situation. She thought of her past life in Sri Lanka, when (even though they had only one meal a day) they were together as a family and happy in the Lord. Now she was alone and, having little understanding of Arabic, was being intimidated when she had to ask for things to be explained again. She got little rest and wasn’t allowed to sleep even when very sick. She was only allowed to eat leftover food and had to work from early morning until late at night without a break. She had intended to work in Saudi Arabia for three years but returned to Sri Lanka after two years. Today, she is still suffering extreme poverty and hardship, but is happy to be reunited with her children. 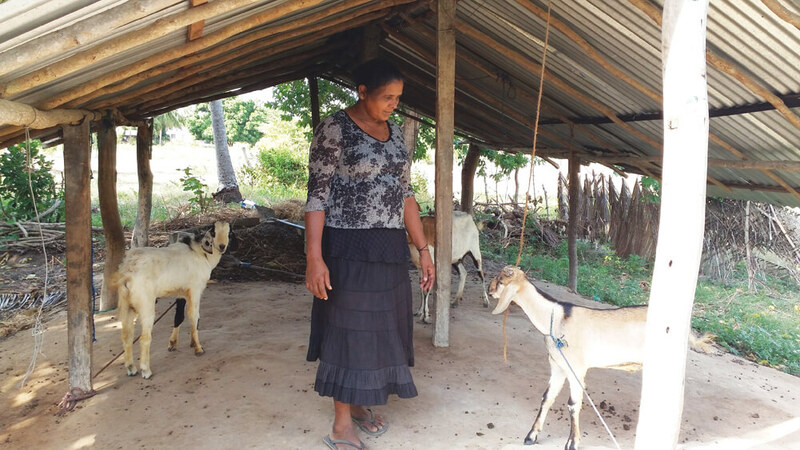 LEFC have provided a garden and goats for her to earn an income. Sadly the strain has deeply affected her marriage. Please pray the Lord will restore her husband to Himself and her and heal the scars the family bears.